Holidaying with your canine companion puts a whole new twist on ‘family holidays.’ However people who think it’s impossible to relax, have a good time and see the sights, all with a dog in tow; we have news for you. It can be done, and is being done by more and more dog owners. In deciding where to go on holiday, you have to also consider how you’re going to get there. Depending on which country you live in, and perhaps are going to, for the most part, dogs are not allowed on trains or buses. There are exceptions for guide dogs and may be for very small dogs, but you must contact your transportation company for details. Dogs are allowed on planes – large dogs are only allowed to travel in the cargo hold, whereas, small dogs are allowed within the cabin – under strict conditions. Again, you must check with your airline about canine travel when booking your tickets. If you do travel by plane, chances are you are going to another country. Before you buy those airline tickets, make sure your dog is allowed inside the destination country without being quarantined for a significant amount of time. Once you know your dog is allowed in the country, ask what vaccines and paperwork you will need in your possession when you land. Traveling by car is the most common mode of transportation for people who bring their dog along. Cars provide the most flexibility that dog owners often want and require. 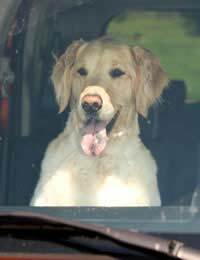 When in the vehicle, ensure your dog is securely fastened either via a doggie seatbelt or if you have an SUV or minivan, with a vehicle barrier. Restraining your dog not only protects them from going through the windshield, in the event of an accident, but it also enables you to concentrate on driving without worrying about your dog taking a nap in your lap, obstructing your view and compromising your driving abilities. Once you reach your destination, where are you going to sleep? Not all hotels and B & Bs allow dogs. Therefore, it may be necessary to contact numerous accommodations in your destination city, prior to ever leaving your home. Be sure to inquire about any fees associated with your dog’s stay and any stipulations they may have. Depending on who you lodge with, they may even provide a few things for your dog like bowls and a bed. Pack a bag especially for your dog that will contain all of his food, bowls, toys, medications and travel documents. Other items to bring along include a carrier/crate, leash, collar with ID tags attached, blanket/bedding, first aid kit, and carpet cleaner – just in case. If you know your dog will claim the bed or any other hotel furniture as his own, bring a couple of sheets to throw over top to help keep the furniture clean. Just because you have a dog in tow doesn’t mean you can’t take in the city sights. A dog makes for a great excuse to see the city by foot instead of through the window of a sightseeing bus. There are lots of organized walking tours available in virtually every city. As well, many of the guidebooks available provide self-guided waking tour information. If you want to participate in organised walking tours with your dog, ask the tour operator if dogs are allowed. To make the tour enjoyable for everyone, make sure your dog is well behaved in public and comfortable in groups of people. If you choose to do something where dogs are not allowed, call around for pet sitting services. Some hotels offer this service, so you can inquire about it at the time you book your accommodations. Otherwise, you will need to make arrangements with an off-site doggie daycare. Again, make these arrangements prior to your departure to ensure availability and that your dog has all the required vaccines and that you bring along the proper paperwork. With a little planning, a fun family holiday can include your dog too.